Google alone processes 40,000 search queries every second, and over 3.5 billion searches per day, and there’s a good chance that at least one or two of those searches relate to products or services your business offers. Do a quick search in Google for your most popular products or services that your company offers right now. Where is your website? Are you having trouble finding it? This is not a good sign. If you can’t find your website in the search results, then how do you expect potential customers to find it? Studies show that 91.5% of searchers don’t make it past page one of the search results. Over 30% of them click on the very first result! By not showing up in Google’s search results, you are literally handing business away to other websites, including your competitors. SEO can remedy this and get you back in the game. No wonder millions of people google the term “SEO” each month. In a world where over 90% of online experiences start with a search engine, showing up on the front page of Google can be the deciding factor between a business that’s thriving and one that’s, well, bankrupt. Without ongoing SEO efforts, you run the risk of losing your top-ranking spots in search results. And competitors will likely jump at the chance to outrank you. Let’s check out some facts here. As it’s said, the critical claim needs critical evidence. And what could be better evidence than the facts. 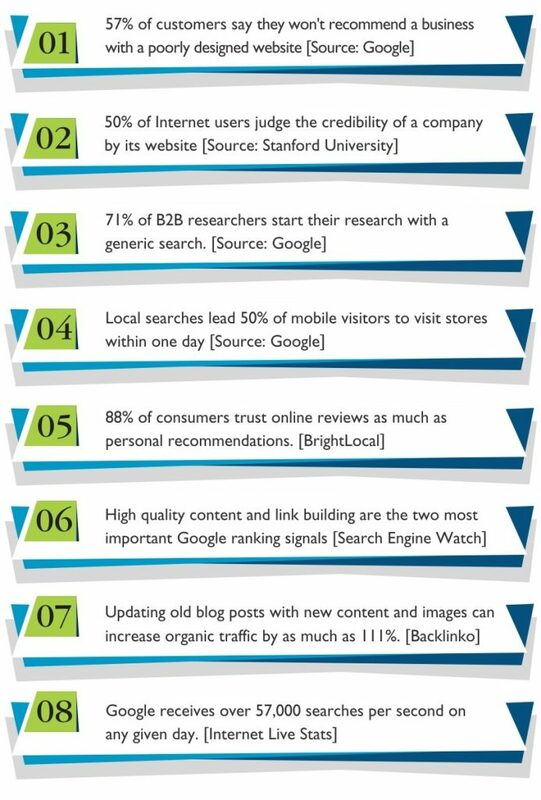 These facts are enough to validate the importance of Doing the right SEO. Search engine optimization (SEO) is a game that’s all about staying one step ahead of your opponents . Imagine, the opportunity to grab your mass audience base. But, you should be aware of its fundamental practices. It’s not that you read about it somewhere and start using it. In today’s rapidly shifting world, SEO techniques can change on a dime—and the worst part is that you might not even know it. Hacks that could have won you a front-page result as recently as 2016 are not only obsolete now, but they may even hurt your website’s rankings. Hence, we have put together a resource list of all the seo definitions and keywords you need to help you succeed with your SEO Strategy. Over the years, we have considered SEO important, and we know we cannot survive in the world of online business if we do not formulate a strong SEO strategy. So, This is where our incredible SEO Agency helps you achieve your business goals. Consequently, being on top of the latest trends and practices would only maximize the chances of your search engine visibility and ranking potential. Our seo experts are ready to serve you if you’re ready stop screwing around and turn your website into a money magnet. And we are sure; you would want to do that. Our objective is to enable every entrepreneur and small business owner to arm themselves with the knowledge it takes to stand up to the big guys.